The origins of the Historiographical Institute may be found in the late Edo period. In 1793, Hanawa Hokiichi, a scholar of "National Learning" (kokugaku) proposed to the Tokugawa bakufu that his Institute for Japanese Studies (Wagaku Kodansho) begin compiling historical records. By 1861, Hanawa's institute produced 430 volumes of source books covering the years 887 to 1024. The starting year 887 was chosen because it was the last year of the ancient Japanese governmental histories. The manuscripts compiled by Hanawa's institute became the basis for the project called Dai Nihon Shiryo, which continues at the Historiographical Institute to the present day. In 1869 the new Meiji government established a new bureau to compile an official national history of Japan that would take up where the ancient official histories left off, and in 1876 the new bureau began to compile historical records using Hanawa's methods; in 1882, the bureau started to write an official history based on the documents it had collected. This official history was abandoned in 1893, but the compilation of source materials continued and led to the publication of the first volume of the Dai Nihon Shiryo series in 1901. 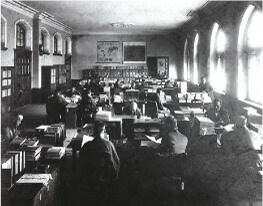 Although the Historiographical Office was originally located within the government, in 1888 its researchers were transferred to the Imperial University, the predecessor of the University of Tokyo. The following year, a National History Department was formed at the University, and three former staff members of the Office were named as the first professors. The department's faculty pursued both historical research and the compilation of source materials. In the reform of research and higher education following the end of the Pacific War, the Historiographical Institute was reorganized in 1950 as an independent research institute affiliated with the University of Tokyo. Staff continue, however, to work closely with the university in training graduate students in Japanese history. Throughout its history, the Historiographical Institute has striven to employ the most advanced methods in its work. While searching for an appropriate system for compiling an official history in the 1870s, the Institute asked the Hungarian historian George Gustavus Zerffi to explain Western historical methodology; in response, he wrote his book, The Science of History (1879). Between 1887 and 1902, the German historian Ludwig Riess, an advocate of Rankean history-as-science, taught at the university. He emphasized that the university's research and teaching needed to be coordinated with the compilation of historical materials, a view that substantially influenced the early development of the Institute. In 1893, the growing realization that the purpose of modern historical studies should be to allow the people to interpret the past for themselves, while the state's role should be to make source materials available rather than write an official history, led to the decision to abandon the project to create an official history. The Institute's mission has continued to expand. Over the years, the range of materials that the Institute compiles has come to include late Edo-period diplomatic documents, materials on the Meiji Restoration, and records concerning Japan in foreign archives. The Institute began computer storage of documents in 1984, and staff continue to search actively for new ways to utilize computers, information technology, and the World-wide Web. In 1997, the Institute established the Center for the Study of Visual Sources, to handle the special challenges of collecting and interpreting pictorial or illustrated materials as historical sources. Also, in 2006, the International Center for the Digitization of Premodern Japanese Sources was established for the new study of historical materials in cooperation with information science. The Institute continues to be the leading facility for research on primary sources related to Japanese history. History is the study of the past; but that study is always situated in the present, and looks to the future. As typified by the Center for the Study of Visual Sources and the International Center for the Digitization of Premodern Japanese Sources,the Institute is committed to expanding the frontiers of its activities to meet the challenges and possibilities of the twenty-first century. 1801 Hanawa Hokiichi proposes to the Tokugawa bakufu that his Institute for Japanese Studies (Wagaku Kodansho, established in 1793) begin compiling historical records. 1801-1861 The Institute for Japanese Studies produces 430 volumes covering the years 887 to 1024. The Institute ceases activity after 1861. 1869 The Meiji government plans to start compiling an official national history of Japan. 1885 Activities begin to investigate historical source materials from all over Japan. 1888 Responsibility for compiling historical materials is transferred from the Cabinet to the Imperial University. 1901 Publication of the first volumes of the series: Dai Nihon Shiryo and Dai Nihon Komonjo. 1906 The Foreign Ministry assigns the publication of late Edo diplomatic materials to the Historiographical Section. 1929 Historiographical Institute (Shiryo Hensan-jo) takes the current name. 1949 The Ministry of Education assigns the Historiographical Institute to work on Meiji Restoration documents. 1950 The Institute becomes an independent affiliate of the University of Tokyo. 1984 The Institute starts working with computerized database and document management. 1997 Establishment of the Center for the Study of Visual Sources. 2006 Establishment of the International Center for the Digitization of Premodern Japanese Sources.